I think one conclusion we can safely draw is that at least some important tendencies in Iran's ruling elite are genuinely worried by the prospect of these intensified economic sanctions, despite frequent Iranian claims to the contrary. A broader question is whether the sanctions — even if successful at lowering Iran’s oil revenue — would force the government to give up its nuclear ambitions. One measure of the effects, however, is that the Iranian leadership is clearly concerned. Already the Iranian currency is plummeting in value against the dollar, and there are rumors of bank runs. 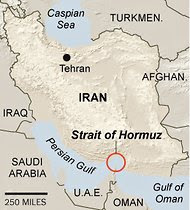 This Iranian threat to blockade the Strait of Hormuz may well be a bluff, too. Using military force to choke off a significant proportion of the world's oil supply would be an act of war. It would be highly imprudent, not to say a bit crazy, for the Iranian regime to take the first step toward starting a war right now. And for what it's worth, they would be unambiguously in the wrong in terms of international law. Furthermore, if Iran did succeed in cutting off all oil exports from the Gulf, the economic consequences for Iran itself would be catastrophic. On the other hand, if governments never did recklessly unwise or crazy things, the world would be quite different from the way it actually is. So we may be headed toward a major confrontation with unpredictable and potentially very serious consequences. The potential economic consequences are serious enough, even if the Iranians never actually try to blockade the Strait of Hormuz. Merely uttering the threat appeared to be part of an Iranian effort to demonstrate its ability to cause a spike in oil prices, thus slowing the United States economy, and to warn American trading partners that joining the new sanctions, which the Senate passed by a rare 100-0 vote, would come at a high cost. Oil prices rose above $100 a barrel in trading after the threat was issued, though it was unclear how much that could be attributed to investors’ concern that confrontation in the Persian Gulf could disrupt oil flows. The new punitive measures, part of a bill financing the military, would significantly escalate American sanctions against Iran. They come just a month and a half after the International Atomic Energy Agency published a report that for the first time laid out its evidence that Iran may be secretly working to design a nuclear warhead, despite the country’s repeated denials. In the wake of the I.A.E.A. report and a November attack on the British Embassy in Tehran, the European Union is also contemplating strict new sanctions, such as an embargo on Iranian oil. For five years, the United States has implemented increasingly severe sanctions in an attempt to force Iran’s leaders to reconsider the suspected nuclear weapons program, and answer a growing list of questions from the I.A.E.A. But it has deliberately stopped short of targeting oil exports, which finance as much as half of Iran’s budget. Now, with its hand forced by Congress, the administration is preparing to take that final step, penalizing foreign corporations that do business with Iran’s central bank, which collects payment for most of the country’s energy exports. The sanction would effectively make it difficult for those who do business with Iran’s central bank to also conduct financial transactions with the United States. The step was so severe that one of President Obama’s top national security aides said two months ago that it was “a last resort.” The administration raced to put some loopholes in the final legislation so that it could reduce the impact on close allies who have signed on to pressuring Iran. The legislation allows President Obama to waive sanctions if they cause the price of oil to rise or threaten national security. The American effort, as described by [David S. Cohen, ... treasury undersecretary for terrorism and financial intelligence] and others, is more subtle than simply cutting off Iran’s ability to export oil, a step that would immediately send the price of gasoline, heating fuel, and other petroleum products skyward. That would “mean that Iran would, in fact, have more money to fuel its nuclear ambitions, not less,” Wendy R. Sherman, the newly installed under secretary of state for political affairs, warned the Senate Foreign Relations Committee earlier this month. Since President Obama’s first months in office, his aides have been talking to Saudi Arabia and other oil suppliers about increasing their production, and about guaranteeing sales to countries like China, which is among Iran’s biggest customers. But it is unclear that the Saudis can fill in the gap left by Iran, even with the help of Libyan oil that is coming back on the market. The United States is also looking to countries like Iraq and Angola to increase production. That adds up to a lot of uncertainties—even if we ignore the possibility of a violent response by the Iranian regime. Stay tuned.